Walla Walla Valley Honda is giving someone the chance to win a brand new Honda Fit on Friday, October 13th, during the College Place High School varsity football game. College Place High School will take on Kiona Benton at Hawks Field at 7:00 pm. During halftime, one lucky raffle winner will have the chance to win a brand new Honda Fit LX! The pregame tailgate at College Place High School starts at 5:30 pm. Walla Walla Valley Honda will be hosting a variety of activities such as fun tailgate games, previews of the new 2018 Honda lineup, answers to car related questions and a canned food drive - How many cans can you fit in a Fit? to support the Care and Share Food Drive. We are asking that all attendees bring a donation of canned food. 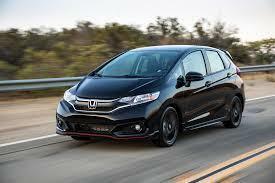 Raffle tickets will be sold for $5 during the pregame tailgate for your chance to win the Honda Fit LX. All proceeds from the raffle tickets will be donated to the Traffic Safety Education Program at CPHS. At halftime a name will be drawn. and that person will be given a chance to complete the task that could win them 2017 Honda Fit! Come out and cheer for the HAWKS, donate to a worthy cause and enter for your chance to win a new Honda Fit LX!